Many people have been asking me about the Vonage situation in light of a recent stock downgrade from Citibank analyst Michael Rollins, who said that Vonage probably has a couple of years to go and at that point they will undergo a financial restructuring or bankruptcy. Recently many have been asking me what I believe the future of this company to be. The recent Verizon lawsuit regarding patents Vonage infringed upon is probably not final if my sources are correct. Many believe the patents Verizon has are not unique and were indeed awarded based on technology which was not invented by Verizon. This of course would have to be proven by someone. I suppose Vonage did their best to do this but was obviously unsuccessful. 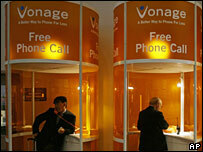 Still, Vonage is a young company and apparently patents are not their forte. They were also hit with a slew of patent lawsuits and the odds were stacked against them. In lawsuits it is not uncommon to throw many things against the wall and hope something sticks. In this case Verizon was successful with this shot gun strategy. So if you take this patent issue away (and I am not suggesting it is over or close to over), Vonage will be dealing with a little less of a problem. As you may recall, damages were determined to be $58 million in damages and 5.5% royalties on any sales going forward. Now many others have already told me they believe, as I've written in the past that the amount of money that Vonage spends annually on marketing is still toohigh. In fact, it's astronomically high for a company of it's size. They are going to spend upwards of $160 million in 2007. The New Jersey based VoIP leader can comfortably cut back on marketing and still do well. There's a law of diminishing return in marketing whereby if you spend let's say $25 million; everything over $25 million is not as effective as the first $25 million. So they can cut back marketing comfortably and still have a bunch of money left over, which could go to the bottom line and actually make the company profitable. In the end the company will probably have to deal with coming up with a triple-play offering of some kind, partnering with some sort of broadband provider, WiMAX or other company. So that's something for later. But for the next three to four years, Vonage is in pretty good shape from the standpoint that they have a critical mass of users – over 2 million in fact. They're a large pure play, the largest domestic pure play VoIP provider. I think their prospects are better than many have realized or give them credit for. That's my feeling about Vonage. Let's see what happens in the upcoming quarters. So if you take this patent issue away (and I am not suggesting it is over or close to over), Vonage will be dealing with a little less of a problem. As you may recall, damages were determined to be \$58 million in damages and 5.5% royalties on any sales going forward. Now many others have already told me they believe, as I've written in the past that the amount of money that Vonage spends annually on marketing is still toohigh. In fact, it's astronomically high for a company of it's size. They are going to spend upwards of \$160 million in 2007. The New Jersey based VoIP leader can comfortably cut back on marketing and still do well. There's a law of diminishing return in marketing whereby if you spend let's say \$25 million; everything over \$25 million is not as effective as the first \$25 million. So they can cut back marketing comfortably and still have a bunch of money left over, which could go to the bottom line and actually make the company profitable.